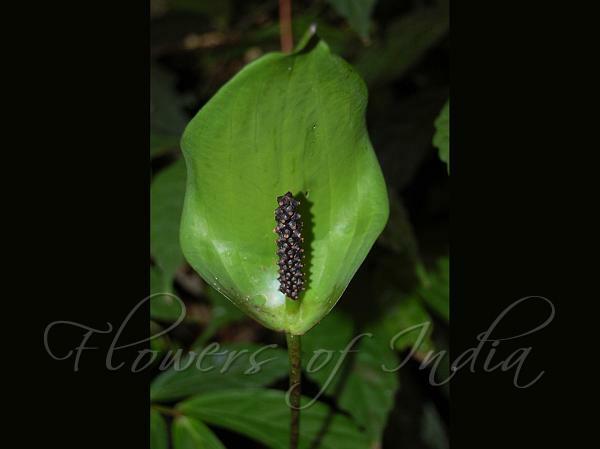 Beddome's Tall-Leaf Arum is a corm bearing herb, named for Col. Richard Henry Beddome, 19th century British botanist in India, Director of the Lal Bagh at Bangalore. Leaf blade is 3-cut, middle lobe pinnately lobed, varying in size. Leaf-stalks are 50-100 cm high, typically of this genus. Flower-cluster-stalks are as long as leaf-stalks. Spathe is green, 5-8 x 2.5-5 cm, broadly ovate-oblong, pointed at tip, round at base. Spadix is blackish purple, 3-5 cm long, 0.3-0.5 cm in diameter. Perianth 3-4. Stamens 4-6. Berries are ovoid, 6-8 mm long, orange red on ripening. 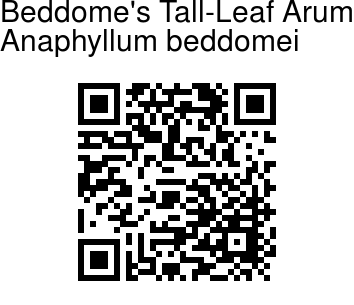 Beddome's Tall-Leaf Arum is endemic to Southern Western Ghats. Flowering: February-March. Identification credit: C. Rajasekar Photographed in Kalakkad-Mundanthurai Tiger Reserve, Tirunelveli, Tamil Nadu.